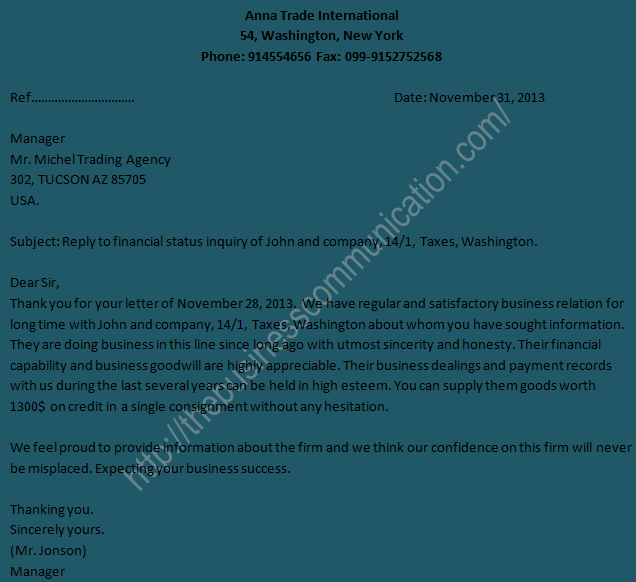 Assume that you are the manager of Mr. Anna Trade International, 54, Washington, New York. Mr. Michel Trading Agency, 302, TUCSON AZ 85705 USA has a letter to you inquiring the financial solvency of John and company, 14/1, Taxes, Washington. Write a positive response to this business status inquiry letter. (Favorable reply to the inquiry letter given in specimen). Subject: Reply to financial status inquiry of John and company, 14/1, Taxes, Washington. Thank you for your letter of November 28, 2013. We have regular and satisfactory business relation for long time with John and company, 14/1, Taxes, Washington about whom you have sought information. They are doing business in this line since long ago with utmost sincerity and honesty. Their financial capability and business goodwill are highly appreciable. Their business dealings and payment records with us during the last several years can be held in high esteem. You can supply them goods worth 1300$ on credit in a single consignment without any hesitation. We feel proud to provide information about the firm and we think our confidence on this firm will never be misplaced. Expecting your business success.